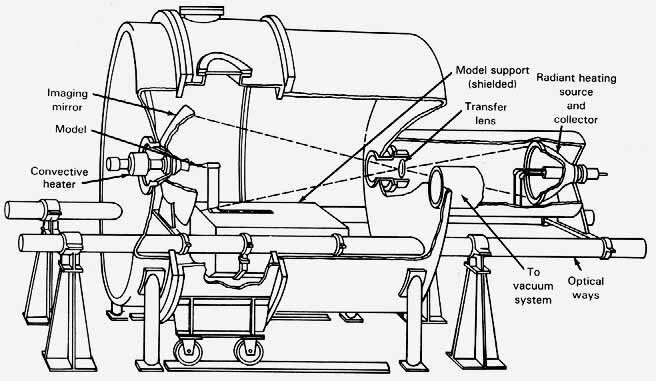 Arrangement of the components of the Ames 3.5-foot hypersonic wind tunnel. Flow was from the high-pressure tank farm, through the gas-fired pebble-bed heater, through the nozzle and test section, and into the vacuum spheres. Photo shows test cabin and nozzles. ....Mach 10 for several minutes. This 3.5-foot hypersonic tunnel filled the gap between the continuously operating supersonic tunnels and the short bursts of very high temperature, very high velocity air available in the hotshot and shock-tube facilities. Compressed gas (air or a simulated planetary atmosphere) from a tank farm was released through a gas-fired pebble-bed heater into a helium-cooled nozzle. Four separate interchangeable nozzles were built for operation at Mach 5, 7, 10, and 14. The Mach 14 nozzle was not used, however, because of unexpected problems with the pebble-bed heater. By mid-1975 thousands of blowdowns, during which air was heated above the melting point of steel, had taken their toll. A flange between the nozzle and heater failed, spewing high-pressure gas and incandescent pebbles over a wide area. The tunnel building was damaged severely and numerous fires kindled in the surrounding area, but no one was hurt. Six months later the 3.5-foot tunnel was back in operation. The 3.5-foot hypersonic tunnel was first applied to basic aerodynamic research in the Mach 5 to Mach 10 range. In 1965 it was made more versatile when nitrogen and carbon dioxide testing became possible. These gases were used to simulate entry into the atmospheres of other planets. The major work of the facility, however, centered on winged reentry vehicles that could return from outer space, maneuver in the Earth's atmosphere, and then land at a preselected site. Most of the aerodynamic testing of the NASA Space Shuttle and its progenitors was done in this workhorse hypersonic facility. An engineer adjusts the model of a reentry body in the test section of the 3. 5-foot hypersonic tunnel at Ames Research Center. ...not use helium instead of air? It does not liquefy until almost absolute zero (- 459° F). As early as 1961, Ames built a 20-inch helium hypersonic tunnel. It was so successful that a Mach 50 tunnel with a 28-inch test section was placed in operation in late 1965. It employed a simple blowdown scheme. Helium pressurized at more than 1000 atmospheres was discharged through a fixed nozzle into vacuum storage tanks. Even with helium, modest preheating to 1500° F was required to prevent liquefaction. 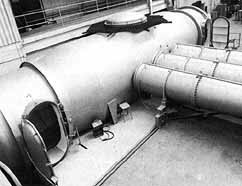 A considerable amount of basic research at extremely high Mach numbers and Reynolds numbers was carried out in this tunnel during the 1960s. But helium is an ideal or noble gas. It is definitely far removed from air, which is the medium bathing aircraft and reentering spacecraft. Helium is monatomic, not diatomic. Its basic thermodynamic properties differ radically from those of air. The simulation of upper atmosphere realities was poor. Consequently, interest in the Ames helium tunnel eventually waned and it was razed in 1970. 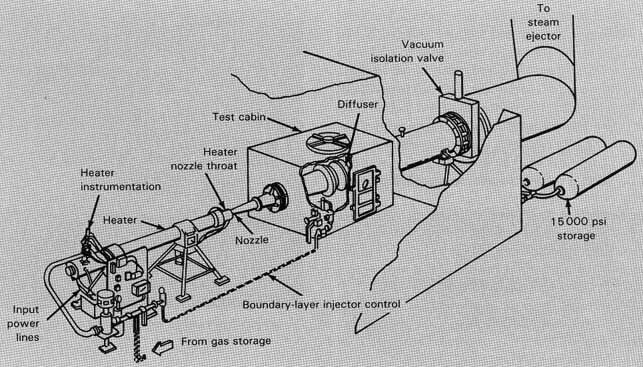 The helium tunnel did however, provide experimental checks on analytical techniques that could then be applied validly to diatomic gases. This helium blowdown tunnel at Ames attained Mach 50. Despite Its very low liquefaction point, the helium had to be heated to 1500 ° F to preclude any liquefaction during expansion. ....brief exposures to high-velocity gases. Heat testing requires exposure over time-at least several minutes. Ames constructed its Advanced Entry Simulator in 1970 for this sort of thermal testing. Airspeeds in this facility are relatively low-Mach 2 to Mach 5-but the models are subjected to intense heating for up to 5 minutes. Furthermore, the heat comes from two separate sources: (1) a supersonic gas heated by an electric arc-jet (Mach 2 to Mach 5) and (2) a 125 -kilowatt argon plasma radiation source. The latter heat source simulates the glowing cap of incandescent gas that builds up in front of a reentering blunt space vehicle. The heat radiated from the gas cap, which is in addition to that conducted and transferred by convection, is of vital importance to the survivability of spacecraft heat shields. By providing these two controllable heat inputs, the relative importance of radiative and convective heating during reentry can be determined. The airspeeds in this simulator were at least an order of magnitude lower than those typical of planetary reentry, so that true environmental heating conditions were not adequately duplicated. Therefore, the main use of this facility had to be the screening of materials for possible construction of heat shields in planetary spacecraft. Promising materials could then be subjected to more rigorous tests in other facilities. By detonating a mixture of hydrogen and oxygen in the breech block of a large-caliber cannon, Ames engineers were able to create gas velocities of 14 000 feet per second, with stagnation temperatures of about 18 000 ° F at the model surface. The exploding gas first ruptures a restraining diaphragm, causing a shock wave to race down a tube containing the test gas. The shock wave compresses the test gas and forces it through an expanding nozzle into a 1-foot test section. Although uniform flow conditions prevail around the model for only about 100 milliseconds (the blink of an eye), instrument response is fast enough to make useful measurements. The Ames explosion-activated shock tube went into service in 1957 with a 1-foot test section. The test section was increased to 42 inches in 1967. 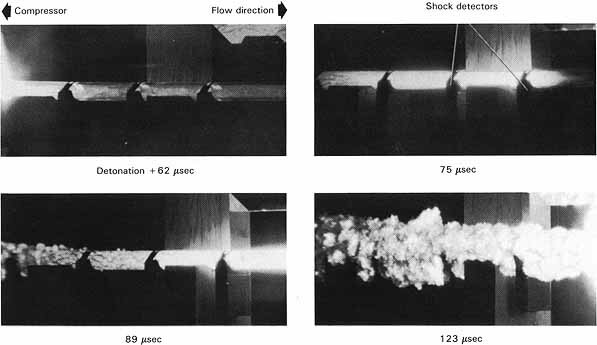 The explosion of hydrogen is a straightforward way to generate high-velocity shock waves, but the technique is messy because of the condensation of combustion products (water) in the driver tube. 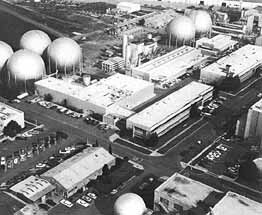 This facility was finally deactivated in 1972. In the Ames advanced entry simulator an arc-let provided airflows from Mach 2 to Mach 5. Heat radiation from the hot-gas cap was simulated by a radiant energy source focused on the model by a lens. A mixture of hydrogen and oxygen was detonated in the breech block of this large cannon at Ames to create highvelocity gas for a shock tube. Electric explosions also produce high-energy shock waves. In place of a cannon, the Ames Electric- Arc Shock Tube used a giant bank of electrical capacitors capable of storing 1 megajoule. When this capacitor bank was discharged through electrodes in the driver section of the shock tube, the 600 OOO-ampere current produced a blinding flash and an incandescent shock wave that pushed the test gas ahead of it through the driven tube. Velocities up to 48 000 feet per second were recorded at the model in the first tests in 1965. By 1974, however, after various improvements and using test gas of hydrogen and helium, shock velocities of 144 000 feet per second (44 kilometers per second) were reached. Such velocities and gases are typical of spacecraft operations in Jupiter's atmosphere. Under such fleeting conditions (a few microseconds) conventional wind tunnel measurements of lift, drag, and so on, are next to impossible. Instruments cannot respond quickly enough. Instead, instrumentation focuses on the temperatures and radiation spectra of the shock wave system formed around the model. With the help of aerodynamic theory, the shock waves tell a great deal about the forces and heating of the simulated spacecraft. In this shock tube, a capacitor bank discharged 600 000 amperes, creating an incandescent shock wave. The driven gas (usually a mixture of hydrogen and helium) reached velocities as high as 144 OOO feet per second. Shock tubes and other intermittent test facilities are completely inadequate for heat shield studies. There must be time for the heat shield temperature to rise to the point at which the protective material ablates and erodes under the scouring action of the incandescent planetary atmosphere. Complete thermal simulation is impossible on the ground. As with the previously described equipment used in testing ICBM nose cones and reentry shields for the Mercury, Gemini, and Apollo programs, no terrestrial test equipment can contain gases at reentry temperatures for the several minutes required. The Ames Thermal Protection Laboratory was built solely for the purpose of solving the reentry materials problem, which spans a mission spectrum from Earth reentry to probes colliding with Jupiter's thick atmosphere. Like the earlier Langley Gas Dynamics Laboratory, the basic concept was to supply, from a central source, a bank of test cells (ten in this instance) with appropriate input and discharge conditions for a wholesale onslaught on the planetary reentry problem. The common input available at all ten test cells was a colossal direct-current power supply of 110 000 kilowatts capacity, with a short-duration rating of 165 000 kilowatts. Forty thousand cubic feet of air at 200 atmospheres pressure were also available, as were large quantities of argon, helium, and carbon dioxide. Each test cell terminated in a common plenum evacuated by a five-stage steam ejector. The equipment in the test cells was always in a state of flux responding to new experimental objectives. The bulk of the tests involved electric arc-jet heating. Most of these arc-jets were of modest size; that is, 20 000 to SO 000 kilowatts, except for that in the 165 000 kilowatt Giant Planet Facility. This arc- jet consumed power equivalent to that needed to propel the ocean liner S.S. United States at 35 knots. 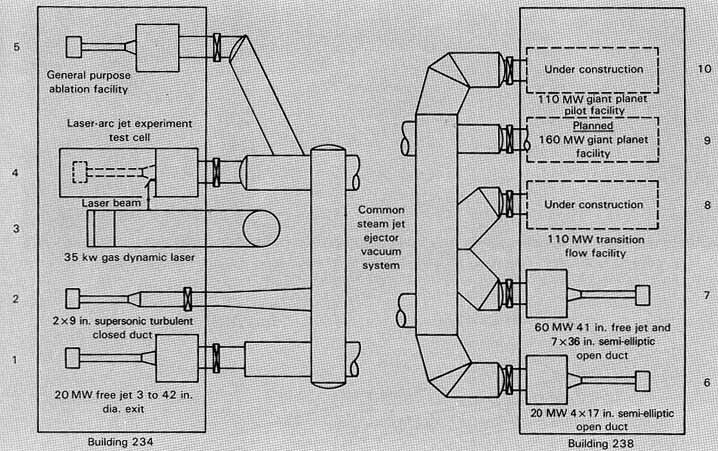 Of special interest is the 35-kilowatt laser added to one of the cells in 1971. The primary goal was the simulation of radiation heating from the incandescent gas cap surrounding the heat shield during reentry, but it was also employed to test the effects of possible laser weapons and the radiation from nuclear weapons. 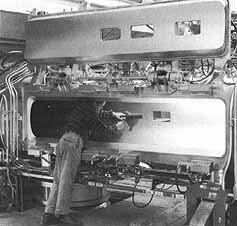 In operation since the early 1960s, the Thermal Protection Laboratory helped find solutions to many vexing heat shield problems associated with the Space Shuttle, planetary probes, and ICBMs. The Ames Thermal Protection Laboratory consisted of 10 test cells containing a wide variety of equipment to simulate reentry conditions. Aerial view of the Thermal Protection Laboratory at Ames showing (upper right)) the pipes leading to the common vacuum system. ....or more. On the other side of the firing range, the socalled light-gas guns could, in the late 1960s, produce muzzle velocities of 30 000 feet per second. The relative velocity of the model and onrushing shock wave was thus 44 000 feet per second. With these improvements a counterflow, free- flight wind tunnel could, for a very brief moment, nicely simulate reentry Mach numbers, Reynolds numbers, and gas-cap heating conditions. Two guns firing at each other at the Ames Hypersonic Free-Flight Aerodynamic Facility. The shock tube (left) fires a gaseous bullet at the light-gas gun (right), which shoots a small model into the onrushing gas. ....were measured in billionths of a second, highlighting the brevity of the encounter. Where can one go after arc-jet and counterflow tunnels? The escape velocity for Jupiter (and therefore the velocity of an impacting space probe) is approximately 200 000 feet per second-far above the reach of the counterflow tunnel. One does not need to resort to electrostatic or electromagnetic acceleration to achieve this velocity-a lowly chemical explosive can do it, providing it is properly shaped to focus its energy. In 1965 a Russian scientist proposed that the shaped charge originally developed for piercing thick steel armor be adapted to the task of accelerating shock waves. 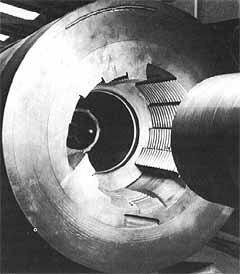 The resulting device, looking little like a wind tunnel, is called a Voitenko compressor. The Voitenko compressor initially separates a test gas from a shaped charge with a malleable steel plate. When the shaped charge detonates, most of its energy is focused on the steel plate, driving it forward and pushing the test gas ahead of it. Ames translated this idea into a self-destroying shock tube. A 66-pound shaped charge accelerated the gas in a 3-cm glass-walled tube 2 meters in length. The velocity of the resulting shock wave was a phenomenal 220 000 feet per second. The apparatus exposed to the detonation was, of course, completely destroyed, but not before useful data were extracted. Frames taken a few microseconds apart show the progressive destruction of the glass shock tube in the Ames Voitenko compressor. 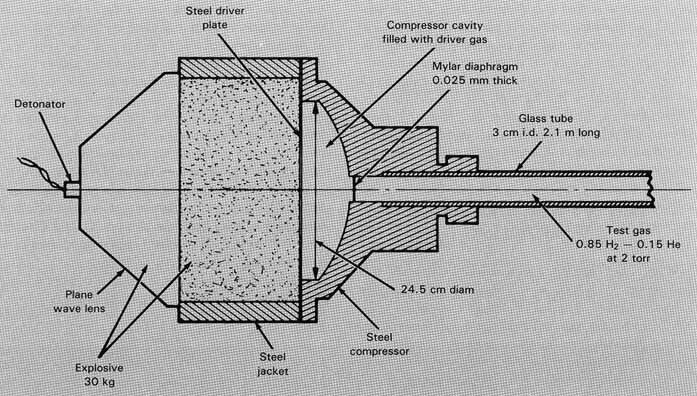 The clue to the success of this expendable device is the observation that the disintegration of the glass tube, in which the model is mounted, lags behind the shock wave in the gas by about 15 tube diameters. High-speed photos, taken via mirrors by cameras protected underground, clearly show the gaseous shock wave well ahead of the wave of physical destruction. This fantastic instrument, so far removed from Wenham's primitive wind tunnel, is the only known "practical" method for generating such extreme velocities.